Located 2000 feet above St. Helena, Schweiger Vineyards can be discovered by those in search of an authentic family winemaking experience. Come up and meet owners Fred and Sally, their son Andy the winemaker, and the rest of the Schweiger Extended Family, including of course the dogs! Enjoy incredible views from our Estate at the top of Spring Mountain, relax, learn, sip wines on the balcony, sit down to a paired tasting or tour the barrel room. Come for our signature Bordeaux-style blend “Dedication” and the Cabernet Sauvignon, but be prepared to be smitten with our Chardonnay and Sauvignon Blanc. Come enjoy our ALL-TERRAIN VINEYARD EXPERIENCE! Explore the incredible mountain sloped Schweiger Estate, with none other than Founder and Farmer, Fred Schweiger, or Winemaker, Andy Schweiger, as your host. As you ride through the vineyards, stops will be made to taste each wine in the block it was sourced from, while getting an up-close look at our farming techniques, terroir, and microclimate diversity. Visit our website at www.schweigervineyards.com for more information. Tasting here feels more like visiting a good friend at their home. You will be greeted by the family dogs, the staff is knowledgeable and friendly, owner and Vintner Fred is always dropping by to say hello (as he lives on the Estate), and his son Andy the winemaker is often available to answer technical winemaking questions. Music in Tasting Room: From rock and roll to reggae, depending on what mood we're in! View from Tasting Room: We have a relaxing and secluded mountain setting, with breathtaking vineyard views from 2000' elevation. 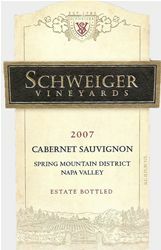 To join the wine club, visit www.schweigervineyards.com/experience#visit or call 707-963-4882. Members receive 20% discounts on current releases, complimentary tastings with paired charcuterie, special event pricing, and varietal exclusives like Malbec and Cabernet Franc, and no additional shipping charges for add-on bottles during shipments. Schweiger Vineyards is certified under the Napa Green Winery Program by the Napa County Department of Environmental Management (DEM) and the Association of Bay Area Government’s (ABAG) Green Business Program and completed all the regulatory components needed for environmental sustainability. These components included developing water and energy conservation methods, preventing pollution, and reducing solid waste. In addition to developing sustainable winery practices, this program is set to become the standard for the state of California. Schweiger Vineyards is certified under the Napa Green Certified Land Program. Schweiger Vineyards has created and implemented a customized farm plan with measured results that addressed all aspects of its property, vineyard land as well as non-farmed land, including practicing soil conservation, water conservation, stable drainage, riparian corridor enhancement, fisheries and wildlife habitat enhancement and long-term improvement and sustainability.